Home Stories Fruit's Got Talent! Even though he was a banana, it doesn't stop him from following his dreams. 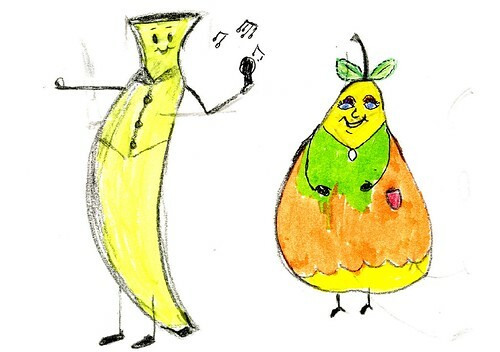 A few weeks after becoming a banana, he decided to audition for the X-Factor. His act was that he could lift a million pounds even though he was only 27 centimeters tall. The only thing that he didn't know was that this was a different X-Factor where they cut fruit into X'es! But first he went to his friend Patricia to ask her advice about going on the X-Factor. And Patricia said, "I think it would be a great idea." Patricia then said, "Why don't you go onto Britain's Got Talent instead?" But he said, "What if the judges try to eat me? They might have forgotten their lunches!"